and local entomologist, Celeste Mazzacano. This event will be family friendly, hands-on water science day of fun. Macroinvertebrates and other creek wildlife will be a focus, and we will also share some information about what individuals can do in their everyday lives to protect water quality. Fun activity stations like macroinvertebrate identification will be stationed throughout the park to take part in with your friends, family and children. Who: Everyone is welcome, families encouraged! What: Science in the Park! Activities, stories, and presentations by local specialists. A macroinvertebrate is basically a spineless organism large enough to see with the naked eye. Common examples are worms, crayfish, snails, clams, dragonflies, limpets, mites, and more! These critters play important roles in nature, and especially in waterways. 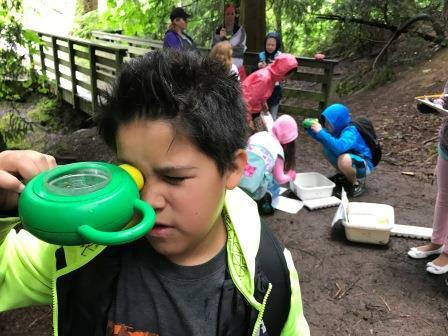 JCWC hosts Science in the Park in partnership with North Clackamas Urban Watersheds Council, North Clackamas Parks and Recreation District and Clackamas Water Environment Services as a fun way to learn about water ecology and quality. We hope to provide an engaging afternoon for Johnson Creek watershed residents and families to learn how we can all be better neighbors to the non-human species who call this area home, too! RSVP HERE, and contact Adrienne at [email protected] with any questions.